Retrofitting your existing sinks with Laminar Flow Restrictors can save up to 7,500 gallons per device. Currently, any non-aerating, laminar flow device that restricts flows to a rate of 1.5 gallons per minute (gpm) or lower for hand washing fixtures qualifies for a rebate. 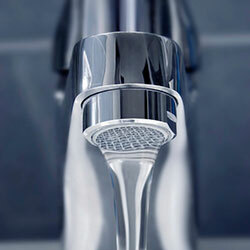 Multi-stream or other aerating flow restrictors are not eligible for rebates. Laminar flow restrictors are to be installed in hospitals, urgent care, and other health care-related facilities. Devices should meet California Office of Statewide Health Planning and Development standards. Click here for a list of rebate-eligible laminar flow restrictors. A rebate program application and all of the personal information listed in it is public record and will be made available to any member of the public who requests it. By signing a rebate program application, the applicant acknowledges that applicant has no privacy expectations to this information and waives any claim to such.